B-Side is a full service restaurant and bar with a lounge-like ambiance. In a space filled with warm walnut mid-century furniture and plush leather couches, guests can enjoy our vibrant food and craft cocktails in an upscale venue that offers both energy and sophistication for your event, reception, wine tasting, or informal dinner party, as well as for your off-site meeting, workshop, conference, or film shoot. Complete with floor to ceiling windows that provide ample natural light, our 1,400 square-foot venue can accommodate up to 60 guests seated (in our mixed style seating) or 65-100 guests standing (furniture removed at an additional fee). 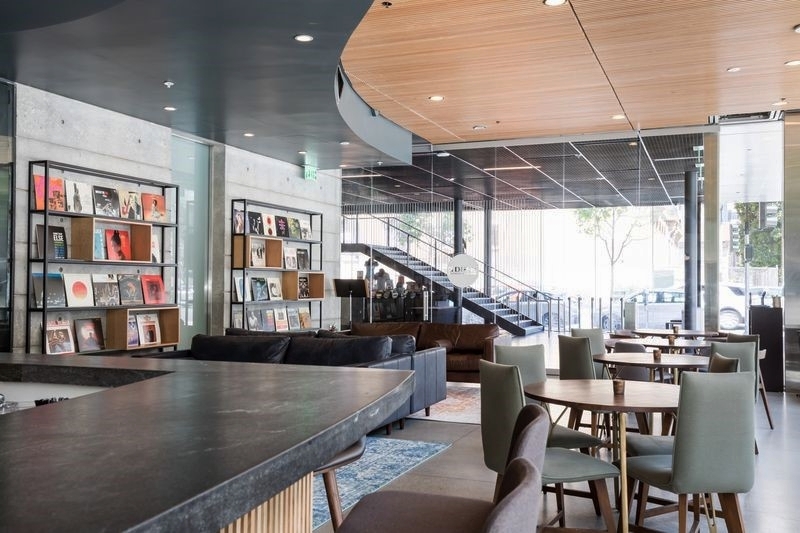 Our in-house sound system offers state-of-the-art acoustics thanks to our custom 9Wood suspended wood ceiling. We have created a menu featuring made-from-scratch dishes like braised pork shoulder, kale Parmesan sandwich, charred chive blossoms with grilled squid, and crave-worthy strawberry fried pie. From our indulgent fried chicken sandwich to the light spring taste of our roasted squash, we developed each dish and cocktail with the thoughtfulness to use simple and approachable ingredients. Note, our menus are seasonal and subject to change. Fitting for our venue, our food is served in a modified family-style manner with beautifully designed platters arranged in designated areas throughout our space so that your guests can enjoy an assortment of bites. 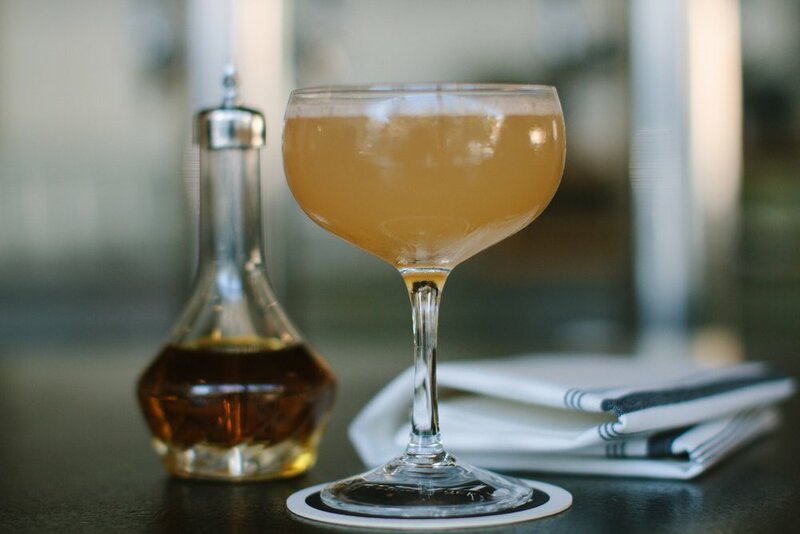 We have carefully curated a beverage menu with each cocktail infused with its own unique ingredients. Our seasonal cocktails are matched with thoughtfulness to the music and events at the SFJAZZ center and are sure to delight. Every plate and cocktail has been thoughtfully developed to match the ambiance of SFJAZZ. For your private event, we offer a few customizable food and beverage packages. Audio-Visual: Not provided. Ability for power and extension cords to accommodate up to 2 microphones. iPod connection capability. Shared WiFi. Turntable available for rent. Perfect for a semi-private pre- or post-show reception or informal celebration. Includes our comfy sofa pods directly next to our jazz LP wall library. Each sofa pod seats 6 people. We have 2 sofa pods with surrounding standing room. Located in the heart of Hayes Valley adjacent to the SFJAZZ Center, B-Side serves craft cocktails, curated wines and modern-American food in a warm and cozy atmosphere. Whether you are planning a corporate get together, holiday party, wedding or social gathering, we are the perfect spot for you and your guests to enjoy great food, cocktails and ambiance. Restaurant hours are Wednesday through Saturday from 5:30pm – 10:30pm. Dinner service Sunday from 3:30pm - 9:00pm. Weekend Brunch Saturday & Sunday 10:00am - 2:30pm. We open exclusively to the public on SF Jazz show nights and are available for private events on ‘no show’ nights and semi-private events on ’show’ nights. For booking information and pricing, please submit the private event inquiry form at the link below. We look forward to hearing from you! B-Side is part of Salt Partners Group. Our portfolio also includes Atelier Crenn, Petit Crenn, Bar Crenn, Horsefeather, Last Rites, Brown Sugar Kitchen, LocoL and Humphry Slocombe. Interested in booking another one of our portfolio restaurants? Please inquire.